Considering his reputation as our foremost chronicler of Man's place in/battle with nature - one which may be defined more by the alt comedy world's fascination with him than by his actual work - it's surprising how little Werner Herzog's presence is felt in his latest, the Netflix documentary Into the Inferno. Sure, his unmistakable Bavarian drone carries the film along, and the subject matter - the destructive/cultural power of volcanoes - is perfectly suited to his unique blend of boundless curiosity and aching pessimism, but he's an almost entirely off-screen presence, and there's little sense of his personal involvement with the project. For the most part, the focus is on volcanologist Clive Oppenheimer, who serves as presenter, expert and audience surrogate as he travels the world, investigating different active volcanoes and placing them in a global, historical context. As a result, the film is more detail-orientated than Herzog's documentaries tend to be, more prosaic than poetic. 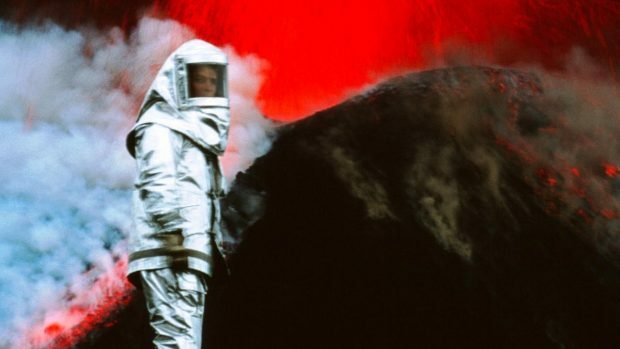 That's not to say that the film lacks poetry, because Herzog finds plenty of opportunities to discuss the myriad ways in which humanity has used volcanos as foundations for belief systems, but there's also a lot of discussion about their practicalities, the science of studying them, and how different countries prepare for eruptions. There's also a lot of discussion of historical eruptions - such as the 1991 Mount Unzen one which killed famed volcanologists Katia and Maurice Krafft, and the Icelandic eruption which disrupted air traffic for weeks in 2010 - as ways of illustrating the sheer power for destruction that they contain. Oppenheimer is an endearing presence, and gives off the calm confidence of someone who knows more about their subject than could be conveyed in a hundred films. There's a pleasing wonkiness to his presentation akin to that of Brian Cox or Simon Schama. While that is by no means a bad thing, it does make the documentary feel more ordinary than most Herzog's films. Despite its globe-trotting structure and interviews with a wide-ranging selection of people, including members of a cargo cult who worship an American named John Frum who they believe lives in a volcano, it's pretty straight-laced in its approach. Each interview is direct and to the point, occasionally broken up by stunning footage of historical eruptions, and there are relatively few occasions for flights of fancy. At the very least, Herzog doesn't imagine a post-apocalyptic world of albino alligators, as he did in Encounters at the End of the World. More's the pity. That changes as the film moves into its second half, which is altogether more in line with Herzog's ideas about "ecstatic truth" than the stricter realism of its first. A visit to Heimaey, an Icelandic island whose population was nearly wiped out by an eruption in 1973, offers Herzog an opportunity to discuss how the near-constant volcanic activity in the country shaped its culture, and to read a poem from the Codex Regius, a collection of ancient verse which he describes as the Icelandic equivalent to the Dead Sea Scrolls. While the earlier sections of the film are more firmly tied to the scientific realm, this marks the first point at which the movie feels Herzogian, even though his voiceover ensures that it sounds Herzogian throughout. That initial foray into a more holistic understanding of volcanoes leads into the film's most fascinating digression; a visit to North Korea. Beginning with an overview of the history of Mount Paektu, a volcano which features prominently in North Korea's creation myth, Herzog and Oppenheimer lay out how Kim Il-sung appropriated the symbolic power of the mountain by using it as a strategic location for his guerrilla actions against the Japanese, then said that his son, Kim Jong-il, was born there (a story which is heavily disputed). In doing so, he made the Kim family part of a direct lineage of legendary heroes going back to the country's earliest days, an approach which cuts to the heart of the propagandistic state that has since grown around his descendants. The North Korean segment of the film is its most interesting, largely because it so seamlessly blends the Oppenheimer and Herzog approaches. There's space to talk about seismic activity surrounding Paektu and the difficulty of monitoring an active volcano in a repressive state, but it also works as a natural jumping off point for a broader discussion about how humanity relies on symbols for meaning, and how those symbols can be easily exploited and manipulated by those seeking power. Into the Inferno's stronger grounding in reality means that it lacks the fevered genius of Grizzly Man, Little Dieter Needs to Fly or Cave of Forgotten Dreams, but it also stops it from flying off into digressive cul-de-sacs the way that Herzog's other 2016 documentary, Lo and Behold, repeatedly does. For a director who so often makes bold choices, most of which pay off, Into the Inferno is about as pedestrian as Herzog gets, and as such is merely consistently good, instead of fitfully dazzling. Into the Inferno is now streaming on Netflix.